Boots, you’ll have to lick them. I was preparing to leave my apartment, to make the usual commute to teach courses at a private university on the outskirts of Paris, when a text message appeared on my phone. The message was brief. In French, it merely said a grave incident had occurred on campus involving a professor. All classes were canceled and the campus was closed. I immediately wondered if someone I knew was hurt. No other messages followed for the rest of the day and I was unable to reach anyone in my department by phone. Googling the name of the school, it slowly became evident from news sources that one of my colleagues had been stabbed by a former student. As the evening wore on, more details were made available on news sites and I realised who the victim was. But it wasn’t until late at night that an official email was sent to university faculty about the tragedy. One of our colleagues, a fellow English professor, had been brutally murdered on the steps of the school by a former student who had failed his courses in 2017. In the following paragraph, we were informed that our classes would resume in the morning. There was no day of mourning. Grief counselors were brought on campus for several days and a free hotline was set up for students and faculty to call in for a period of two weeks. At the end of the term, the university hosted an evening memorial to honor the life of the slain professor and his dedicated service to the institution where he taught for over two decades. (He had planned to retire at the end of the academic year). He was a beloved teacher and hundreds of students, faculty and staff were present to pay their respects. But there was no special meeting scheduled for those of us in the Languages Department who knew him – some people had worked with him for many years and were friends as well as colleagues – nor were assurances made that additional security would be put in place. We emailed one another in the days following his death, sharing our concerns and knowledge of the circumstances of our colleague’s death. The former student had blamed the English faculty for his academic failure, and targeted one of us. Some of us confessed we were afraid to be alone in an elevator with students. Others couldn’t sleep, had difficulty walking past the site of the murder and felt physically ill. Everyone was distressed, sad or fearful but felt compelled for practical reasons to continue to work as we all lack paid personal or sick leave. Looking back at this, it’s difficult to convey in words my shock over what happened as well as the school’s callous handling of it. I teach at three schools in the Paris metro region as an adjunct professor – what’s called a ‘vacataire’ or ‘chargé d’enseignement’ in French vernacular. [ii] My students number 200 – although this fluctuates – and I teach about six courses annually – usually with several sections for each course and between 20 to 40 students in each section. My salary ranges from 39 to 45 euros an hour before taxes. After taxes, I earn less than 10,000 euros a year. If I take a day off because my child is ill, I’m not paid. I’m only remunerated for the time I’m in the classroom, teaching. This does not include course design and preparation, grading, faculty meetings, nor do I receive transportation subsidies from the schools where I teach. When I asked for a raise last year at one school, after three years of teaching there, I was told that ‘vacataire’ salaries are set by the university administration and, I learned, if the university is public, by the Minister of National Education. The majority of adjunct faculty in France, like me, earn approximately the same hourly wage as twenty years ago, a rate set by the government (41 euros/hour). When our salaries are averaged out to include all the unpaid work we do, we make less than the national minimum wage (SMIC). It’s a common misperception that there are strong labor protections in France; although this is shifting with the advent of the ‘yellow vest’ movement in November 2018. Likewise, when we think of violence in schools or on university campuses, the United States comes to mind first, usually not European countries. In 2019, the majority of university professors in North America are part-time adjuncts; this is on trend in Europe as well. While France still has a higher ratio of tenured professors [‘maîtres de conférences’] to adjuncts – slightly more than half compared to the US where about 75% of faculty are contingent – these posts are increasingly replaced by part-time adjuncts as people retire. Adjunct professors in France work without permanent contracts – and many of us work with no contract at all – or benefits (including access to unemployment insurance, maternity and sick leave, and paid holidays). Due to our status as ‘vacataires’, we are also often limited in the number of hours we can teach at one institution (96 hours per annum) so most of us teach at three or even four schools. We are routinely informed weeks or even mere days before the academic term begins whether courses and class schedules have been confirmed, changed or canceled; the number of students in classrooms increases each year; we wait months – sometimes until the following summer – to be paid; and endure persistently chaotic work environments. All of these examples constitute forms of structural violence. There have been a number of excellent articles and books published recently on the crisis of education in North America and the United Kingdom, extending from primary schools to university. Based on my own experiences as a teacher and a mother in France, the crisis extends to Europe where austerity measures slash budgets for public education. The crisis is – at least in part – an outcome of neoliberalism which imposes ‘free market’ models on schools, commodifying education, seeking ‘returns’ at the lowest possible cost, and transforms teachers – with advanced degrees – into temporary, low-paid labourers. I have no hopeful solutions with which to conclude. In France, adjunct professors don’t have union representation – which contributes to our situation. 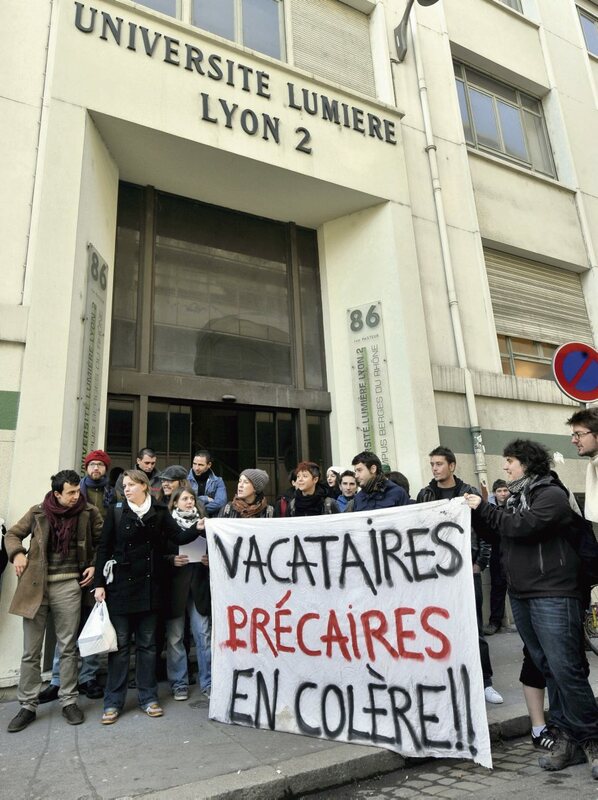 In recent years, adjuncts at a number of public universities across the country have protested, demanding better work conditions, permanent contracts and regular paychecks, including at public universities in Paris, Lille, Nantes, Lyon and Poitiers. As I write this, we enter ‘Act 22’ of the ‘yellow vest’ protests for economic justice. Primary and secondary school teachers are protesting and striking regularly against draconian changes to the labor laws, and a women’s strike was held on 8 March for equal pay (for the same work as men). It’s unclear if these actions will stop or even slow the neoliberal onslaught. I’m saddened by the death of my colleague – someone I knew for a short three months but whose murder still haunts me. In my view, it’s crucial to emphasise the continuum between forms of structural violence which culminate in bursts of direct violence. Our struggles against different forms of structural violence must also be linked. Neoliberal reforms, including the privatisation of public goods like education, transportation, infrastructure, and healthcare, that are being rammed down our throats in France, impact all of us whether we are primary school teachers, students, university adjuncts, railway workers, taxi drivers or airplane pilots. Organising, in (and outside of) unions, striking, refusing to cooperate in mass demonstrations of civil disobedience, appear to be our most effective and direct path, for now, toward a recognition of our collective demands.